Paternoster is the oldest fishing village on the West Coast of the Cape. Away from the grips of urbanisation, Paternoster lives by its traditions and maintain its rustic atmosphere. Paternoster means “Our Father” and derives its name from the prayers of ship-wrecked Portuguese sailors. It takes a 90-minute drive from Cape Town to reach the historic Paternoster. This charming coastal village has everything to portray the typical West Coast life. The local people are all deeply connected to the sea. In fact, the sea is a way of life for the local people with fishermen heading out in colourful traditional wooden boats to catch snoek in winter and crayfish in summer. Visitors can luckily buy fresh fish off the boats themselves. No other neighbouring coastal area can surpass the picturesque fishing village of Paternoster. The kilometres of endless white beaches are lined with dozens of fishing boats that still go out to sea every day. The main road is lined with good restaurants, art galleries, a hotel and speciality shops, all within walking distance of the grand Paternoster Manor. Moreover, adding to the charm of the village, there is a wide array of activities available for visitors. Visitors can remain reassured that they will find many interesting things in Paternoster to make their holidays a wonderful experience. Paternoster is a favourite get-away destination for Capetonians. It is also popular with visitors from abroad who are looking for some relaxation in a peaceful and quiet retreat. As such, Paternoster is an all year round famous destination. There are many attractions and activities in Paternoster and its surroundings. Paternoster is watched over by the Cape Columbine lighthouse. Make your way up the spiral staircase of the lighthouse and gaze at the spectacular views of the formidable Britannia reef and Atlantic Ocean! The prominent rocky point is just five kilometres from the village of Paternoster and is definitely worth a visit. The lighthouse stands tall in the Cape Columbine Nature Reserve. Here, you can not only explore the lighthouse, but you can admire the beauty of the surrounding Cape Columbine Nature Reserve. 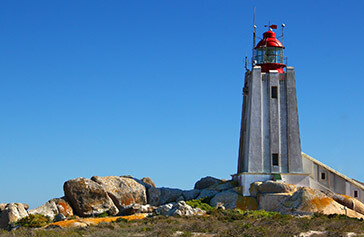 The Cape Columbine Nature Reserve not only boasts of the last manually controlled lighthouse to be built in South Africa (the Cape Columbine lighthouse) but it also renowned for its sheer beauty. After the first spring rains, landscape is transformed by the millions of indigenous flowers which bloom and densely carpet the earth in bright bursts of colour. From August to October, the reserve is scattered with wild flowers and the coastline has a rich sea life, particularly crayfish and abalone. The reserve is a favourite camping ground for summer holiday makers who want to be close to nature and the water’s edge. In the Cape Columbine Nature Reserve, numerous coves, inlets and bays brim with life. The Cape Columbine Nature Reserve is also home to the infamous Tietiesbaai. From here you can rough it at the Beach Camp which has kayaking and surfing facilities. The beautiful dry-stone building is a working ceramic sculpture studio. It houses the original works by artists such as Hennie Meyer, Theo Paul Vorster, and Judy Woodbourne. The gallery also showcases contemporary fine art and limited editions of locally and internationally acclaimed photographers. It also encourages new talents. These prints are displayed in both canvas and fine art cotton rag paper. Paternoster has an endless stretch of deserted white sandy beach. The great and unspoilt beaches make up hang-out spots where visitors can relax to the rhyme of the sounds of the crashing waves. When you think about Paternoster beach, think of spectacular sunsets, succulent West Coast seafood, brightly painted wooden boats and friendly fishermen. Other interesting attractions on Paternoster beach are long strolls on the beach, seal and penguin watching. Whales and dolphins can be watched almost throughout the year. For bird lovers, Paternoster is home to over 250 species of birds with sea-birds (seagulls, cormorants, sacred ibis and the Oyster-catcher) which use this coastline as their breeding ground. Aside from long, unspoilt beaches, it is the restaurants that pull in the crowds. Something of a gourmet hotspot, this seaside village has some incredible restaurants. 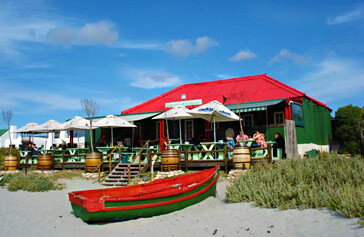 Foodies will love Paternoster for the wide choice of food available. The West Coast is home to many coastal villages and towns, but undoubtedly, Paternoster remains the best place for gourmets. From fresh crayfish to pizza topped with smoked snoek and bokkoms, there is something to suit all tastes. Also, Seafood braais is very popular in the area. There are some really excellent restaurants in this coastal village. 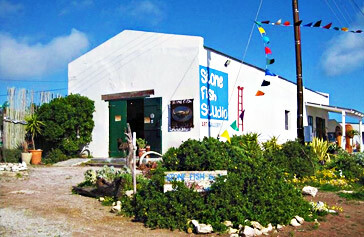 Some popular restaurants in Paternoster are: Gaaitjie, The Noisy Oyster, Voorstrandt, Blikkie Pizzeria ans Saffron Restaurant. 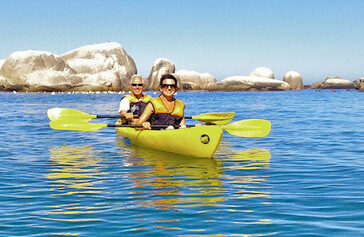 Kayaking is a very popular activity in Paternoster. Enjoy kayaking with an experienced guide! All safety gear and paddles are provided. The trips depend on the weather and leave early in the morning - the best time to enjoy the Cape West Coast. The starting point is from the main beach where the fishing boats are pulled up on the sand. A short beach briefing prepares the paddlers. This is then followed by a gentle kayak to the main rock point off Paternoster. The route is easy and offers the enjoyment and safety of even a first time sea-farer. Dolphins, seals and whales are common in the bay. Moreover, there is plenty of varied bird life on the rocks. One can count the increasing penguin colony or see nesting cormorants. Drikus Horse Riding is located on the farm ‘Swartrug’ (only 8 km from Paternoster) offers beach and cart rides, stabling and riding lessons. Numerous horse trails are available upon request, both for experienced and novice riders. From '1 hour' trips to weekend party trips, Drikus Horse Riding caters to the needs of one and all. Sunset rides along the beach can also be arranged. Moreover, picnics and sundowners can be organized upon request. Stabling and camps are also provided for visiting horses. Some protective gear is provided for those riding. Children are also welcome to ride with their parents. Take in the sights and sounds of the scenery, vegetation, bird life and sunsets – enjoy the beauty of the West Coast on horseback! One of the 5 trails created by the West Coast Biosphere Reserve, the Five Bay Trail takes you to explore the coast between the fishing villages of Paternoster and Jacobsbaai. Participants complete 28 km in 2 and a half days. This trail allows you to witness the contemporary life in the fishing villages. The trail starts on a late afternoon with a stroll along the beaches of Paternoster as far as ‘Tweede Mosselbank’ (named such by local fishermen) and dinner at a local restaurant. Day two takes you through the village of Paternoster along the beach to Cape Columbine Nature Reserve and Tietiesbaai. While this stretch remains calm in winter, during the summer months, there is an air of festivity with the crayfish season and the high number of campers. For most parts of the two days, you will follow rocky shoreline and swim in beautiful tidal pools. During spring, you will get the opportunity to admire the wild flowers. You can have lunch on the rocks overlooking the sea just beyond Tietiesbaai. Passing through Noordwesbaai, you will reach Trekoskraal where your day will end. Day three follows the tracks around the headland of Trekoskraal and beaches of Wesbaai. The final bay before Jacobsbaai is the little Hospitaalbaai, where ships used to drop the sick before reaching quarantined Cape Town. Jacobsbaai is where you lunch at the end of the trail. During this beach hike, you may spot whales, dolphins and seals.